"He was a wonderful father." "Doug was a very bright, personable guy, who also served as..."
"My condolences from a former Queens Commerce classmate. He..."
"Doug was a model Canadian, public servant, boss, and..."
The Hon. 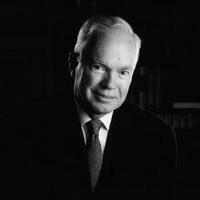 Douglas D. Peters PhD PC, former Senior Vice President and Chief Economist of the TD Bank (1966 – 1992) and Secretary of State (International Financial Institutions) (1993-1997), died peacefully at the age of 86 while on vacation in Amsterdam on Friday, October 7, 2016, with his daughter, Catherine, and partner of 6 years, Judith Mills, by his side. Doug was born in Brandon, Manitoba on March 3, 1930 to Mary Gladys (née Dennison) and Dr. Wilfrid Seymour Peters. He graduated from Queen's University in 1963, the winner of the medal for the top student in Commerce. Upon receiving his doctorate from University of Pennsylvania's Wharton School of Business, Dr. Peters began a 27-year tenure as Chief Economist and Senior Vice President of the Toronto-Dominion Bank in Toronto. Upon his retirement from the bank in 1993, Doug, who had been openly critical of the Mulroney government's economic policies, announced that he was running as a Federal Liberal candidate in the riding of Scarborough East. He was elected as MP and was appointed Secretary of State (International Financial Institutions) under Finance Minister Paul Martin in the first Cabinet of Prime Minister Jean Chrétien. He retired from politics in 1997 but continued his public service post-retirement by volunteering with Canadian Executive Services Overseas (CESO). A devoted traveller, Doug visited more than 60 countries in his lifetime, and the walls of his Toronto home were decorated with many pictures of his visits to the four corners of the world, a photo collection which was ever expanding. As much as his endless curiosity, Doug was characterised by his irreverent wit and a belief in social justice. The stories of Doug's generosity are legion and he sought to lend a hand to both people of promise and those less fortunate throughout his lifetime. Doug was predeceased by his beloved wife of 53 years, Audrey (nee Clark) and his older sister Jean Garten (nee Peters) and is survived by his adoring children, David (Alina Savitska) and Catherine and his cherished grandchildren, Keir and Evan Gilchrist, as well as his loving partner Judith. Details of a memorial celebration of his life are forthcoming.